diabetic breakfast recipes. Here's a collection of appetising and healthy breakfast options for diabetics. What should diabetics have for breakfast? That is always a hard question to answer for the average person as lots of restrictions are there. The key to see is that you never miss breakfast whether you are a diabetic or not. Skipping breakfast would probably be one of the causes of getting diabetes. We need to eat small regular meals to live a healthy life. So have breakfast and eat a healthy breakfast which works for diabetics. Diabetics should try and eat low glycemic index fruits and try and stick to low carb foods. Eat more of fiber for breakfast through your chilas or healthy Indian pancakes. What foods should diabetics try and include in breakfast? Indians traditionally have some form of bread for breakfast. The suffed nachni roti has diabetic friendly vegetables like methi, cauliflower and fenugreek. We suggest you pair this with some low fat curds to make a complete breakfast by itself. A healthy snack which is full of protein, calcium and fiber is just what a diabetic needs in the morning. Have the Doodhi thepla recipe which is made of whole wheat flour, doodhi and low fat curds. This doodhi thepla can be had with some lehsun chutney and a glass of masla chaas to make a complete diabetic breakfast meal. You must include bajra in your breakfast during the week. This stuffed bajra roti recipe has low fat paneer, methi and tomatoes. Perfect for a complete breakfast meal. The fiber in bajra binds with the cholesterol and fats and ensures that it is ejected from your system. Can diabetics have Idlis for breakfast? Yes, diabetics can have idlis. But not this traditional idli recipe as par boiled white rice is full of simple carbohydrates that may induce weight gain. Instead have the fibre rich oats idli which has no rice used. Can diabetics have dosa for breakfast? Yes, diabetics can have dosas. But not this traditional dosa recipe as it has lots of rice. Have the fibre rich oats dosa which is gluten free and a good source of protein. Even better is add peas to the oats for a filling oats mutter dosa fiber rich recipe. Buckwheat is a low GI seed which will slow down the release of nutrients and thus manages your blood sugar levels. Hence it’s an excellent option for switching your regular Dosa to having Buckwheat Dosa. Healthy Indian Pancakes for Diabetics. Breakfast for Diabetics should not have any refined flour in them. Chana dal pancakes are very good because the high fiber content of the dal allows slow release of glucose into the bloodstream and manages your blood sugar levels. The combination of green peas and moong dal helps to enhance the fiber and protein content of green peas pancake recipe. Oats + Vegetables make a perfect option for vegetable oats pancake recipe for diabetics. Buckwheat is considered as anti-hypertensive seed because of its high potassium and low sodium content and works great for buckwheat pancakes recipe made with sour low fat curds and doodhi. Soya is diabetic friendly and we have the soya poha recipe with onions added to give it a crunch and the regular green chillies, coriander and lemon juice. Oats upma recipe is a meal by itself as it has oats which are fiber rich along with onions, carrots and green peas. We suggest you cut the oil a bit in this recipe. Karela is extremely beneficial to diabetics and use it in any form. This karela thepla recipe uses the peels of karela and whole wheat flour and bajra as its base. It is suggest for diabetics to have karela juice first thing in the morning. Karela is also a great source of potassium and works for those with high blood pressure too. This Mangalorean tea recipe is made of spices and a little milk. Diabetics can a have simple cinnamon tea in the morning as cinnamon imparts a lovely flavour to hot water. 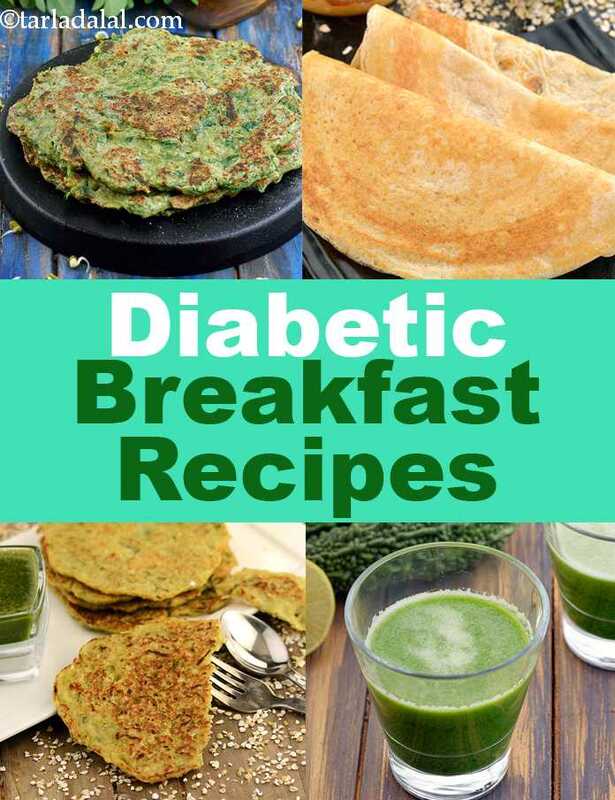 Enjoy our diabetic breakfast recipe collection along with other related diabetes articles below.